Personally I'm a fan of the Flornoy. Photo repros are hard on my eyes. As of right now that one is still my top pick. I will probably order it soon, I was just hoping to read a detailed review somewhere first. Philippe, do you mind sharing your opinion, and a bit of info on the cardstock, surface texture, and overall quality? I am also wondering about the smudge across the face on 13. Was that cleaned up at all? The Hermits Lamp is selling one. I own the Flornoy restoration, and it is superb. I won't be getting the repro just yet, as I can't justify that. Oh, btw I also just notice that the Open Library has ONeill's book available to borrow as a PDF. Sold! Thank you for your advice, I bought it and received it and it is so beautiful! Small, creamy, a dream! Creamy, yes! What a great and accurate description. the cardstock seems rather stiff even if the deck is only 26 mm thick, cards are 101 X 62 mm and have square corners; the finish is resolutely mate, very uniforme (I appreciate that) but with a pleasant satin effect; the cards slip smoothly (not as much as a linen cardstock of course). The editorial choices have been to clean all the backgrounds, to soften the blue but to enhance the yellow and the orange for the brown areas. The library stamps have been removed, stencil drips repaired, and sometimes details are reconstructed (for instance the missing part of the king's crown below). Wonderful! I appreciate all the scans and the info on card quality and finish. I am looking forward to getting them. Philippe, can you please tell us about the D'Allemagne version. Is it still available? 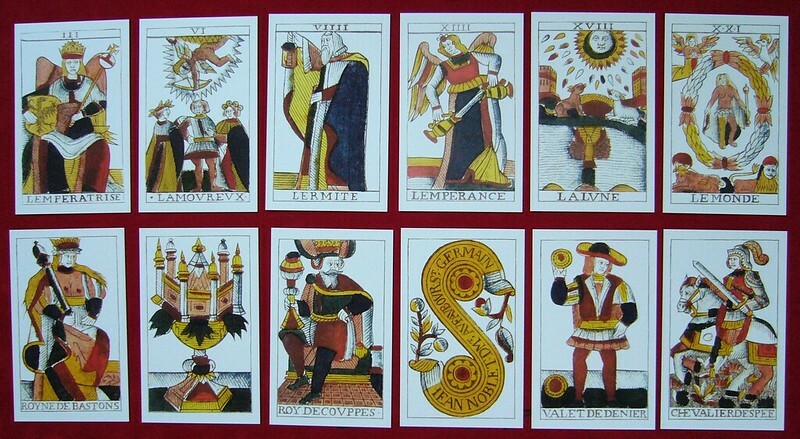 d'Allemagne refers to a book (2 volumes), not a deck. 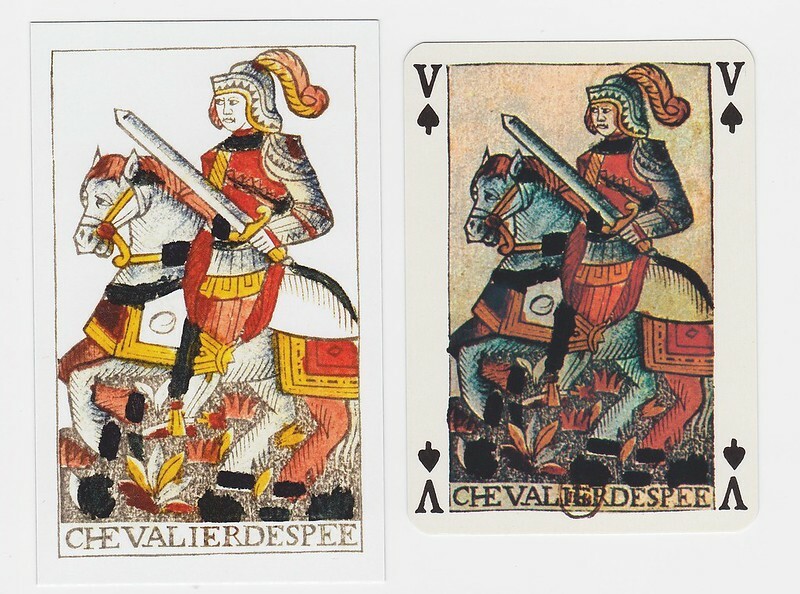 It is one of - if not *the* - definitive works on playing cards and their history, although it is a little dated now since it was published in the 1900s.